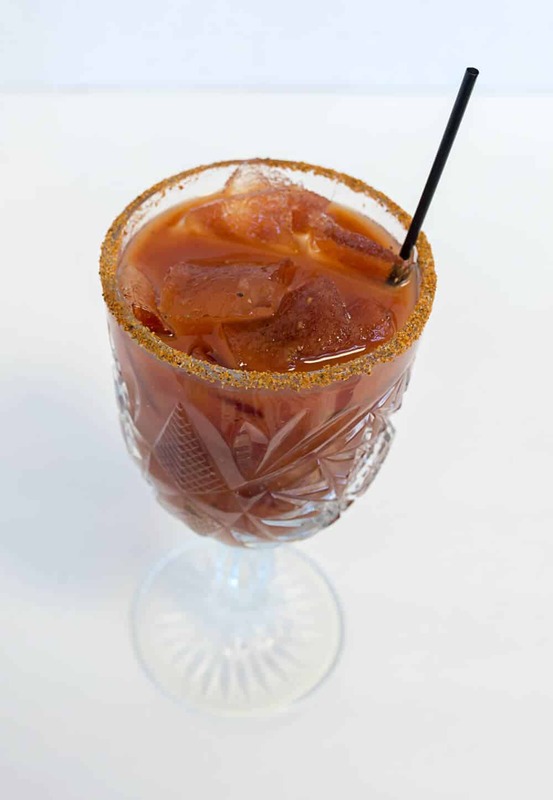 Bob’s Grill offers Breakfast and Lunch daily, year round. 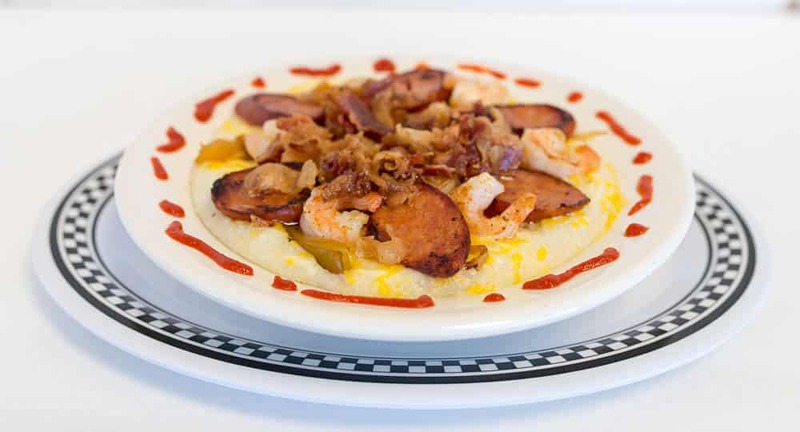 You can’t beat options like classic Shrimp & Grits with Andouille Sausage, ten varieties of stuffed Omelettes alongside the “Best Hashbrowns on the Beach” and their famous no-filler Crab Cakes. 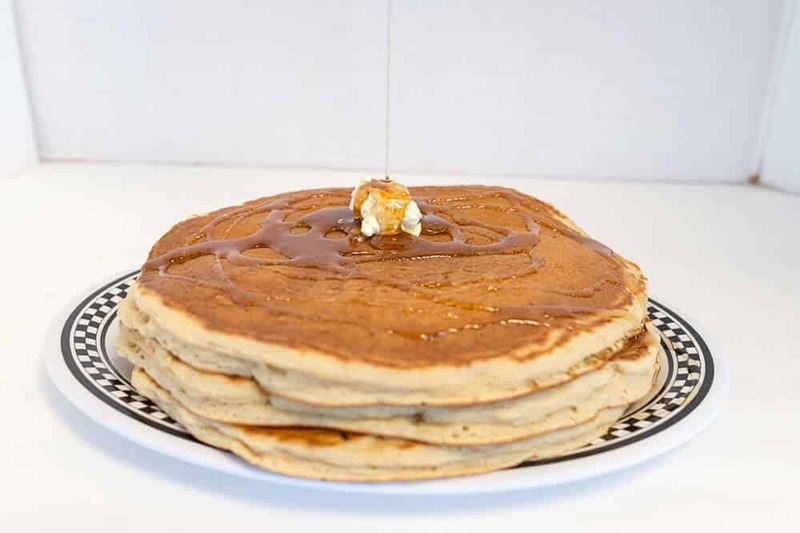 Bob’s Grill also features the largest Hot Cakes you’ll find on the beach. 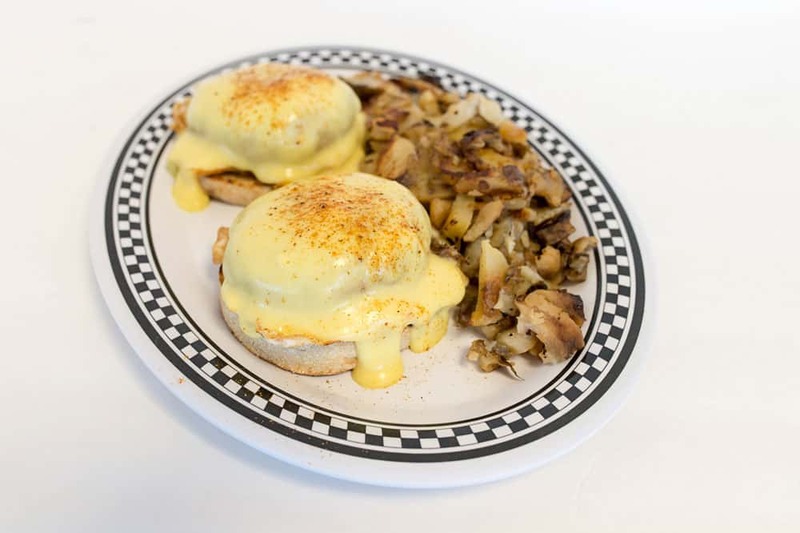 Outside of the classic breakfast-fare and seafood options, Bob’s also offers options for those eating light or with dietary restrictions. They feature a variety of salads and healthy breakfast options alongside sandwiches and breakfast platters. 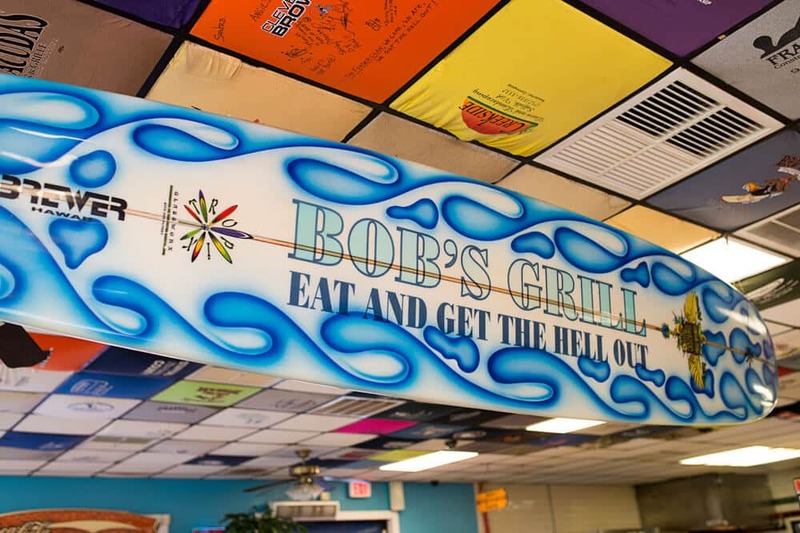 The “Eat and Get the Hell Out” slogan developed quite naturally shortly after Bob’s Grill opened in its first location in 1994. Lunch time was so popular that owner, Bob McCoy, moved among the crowd encouraging them to finish their meals and make tables available for others, many of whom had only 30 minutes for a lunch break. Soon customers encouraged him to print T-shirts with the slogan and even to put it on his restaurant sign. He freely admitted to having been hesitant to do so, fearing that it might offend potential customers, but eventually he gave it a try and found that it drew far more customers in than away. 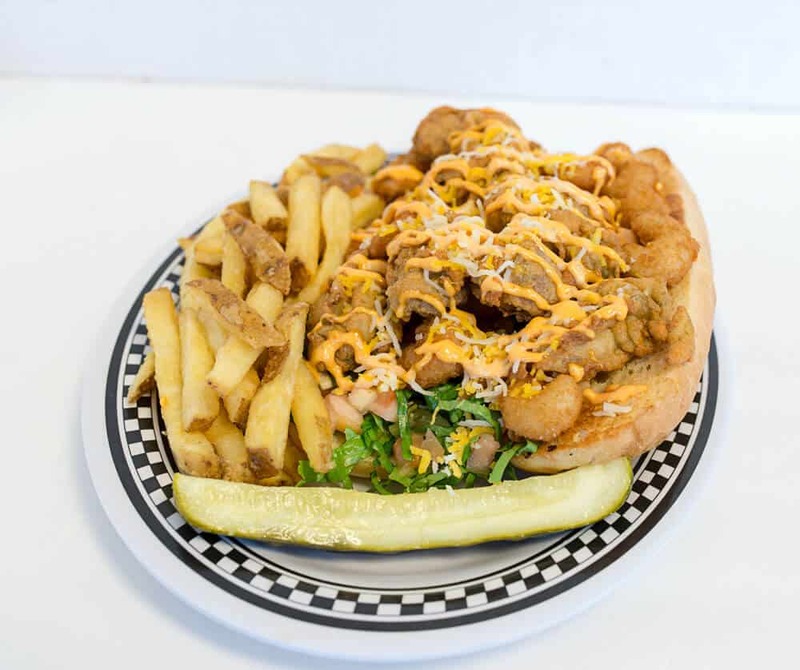 Bob’s Grill grew in popularity and was moved to its present location at Milepost 9 on the 158 Bypass in Kill Devil Hills. Today folks from all over come to dine and purchase his famous t-shirts, aprons, hats, cups and more. 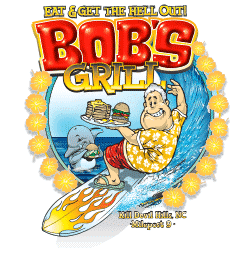 When you’re on the Outer Banks be sure to stop in and say “hi” and perhaps take home a souvenir of your own to prove that you “Ate and Got the Hell Out” at Bob’s Grill OBX.